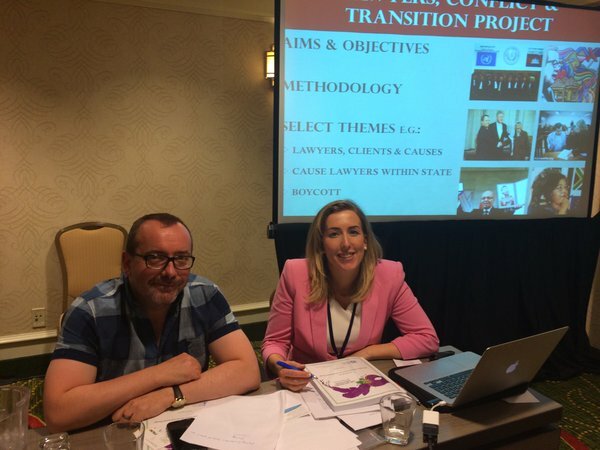 Professor Kieran McEvoy and Dr Anna Bryson have just returned from the annual Law and Society Association conference in New Orleans. The presentation explored the particular experiences of female ‘cause lawyers’ in conflicted and transitional societies in their struggles to build a better society. Drawn from the ongoing ‘Lawyers, Conflict and Society’ project which involved fieldwork in Cambodia, Chile, Israel, Palestine, Tunisia and South Africa, the paper looked at opportunities, obstacles and the obduracy required from these lawyers to ‘make a difference’ in challenging contexts. Drawing upon the literature on the sociology of the legal profession, cause-lawyers, gender and transitional justice, the paper also considered the applicability of that theoretical and empirical scholarship to the ‘exceptional’ circumstances of political conflict and transition. Whilst acknowledging the very different political and cultural contexts in which individual lawyers interviewed have lived and worked, the authors considered a range of issues including the notion of conflict and transition as an opportunity for women lawyers; the intersection of gender with other elements of the struggle for change in conflict and transition; the consequences for personal life, family life and relationships for women cause lawyers; the durability of patriarchal aspects of legal culture; and the relationship between gender-focused activism and the ways in which both past struggles and ongoing transitions are imagined and reproduced. They concluded with the suggestion that the study of cause lawyers offers a rebuttal to the ‘exceptionalism’ critique of transitional justice and suggests that the work of cause lawyers speaks directly to the reality of women exercising increased agency and responsibility in transitional justice.